These used to be an essential for the Xmas stocking. Have you found any this year? I found some in the Newcastle Grainger market, and they're just as delicious as I remember them. Quite expensive though, I only bought 4. Give me a Cox's Orange Pippin any day. Strangely enough I was asking about the Mac Reds yesterday. They spelt Christmas as the smell of them permeated through the house especially when at the bottom of a filled pillowcase on Christmas morning. I'd have bought half a dozen if I'd seen them and their shiny red skins. Evidently the McIntosh is the mother of the Cox, Golden and one of the red apples. It was always Cox’s in our house because my father favoured them, and I hated and still hate them. I have never seen a Red Mac. In Autumn this year I came across a trees on our estate that had a red skinned apple the flesh of which was almost entirely red. It was crisp and sweet with a slightly tart edge. I thought at the time it would make a wonderful apple to eat at Christmas! I’ve no idea what it is called, but I am hoping to cabbage a few more next season and will try and store them. I love Coxes, and have never enjoyed Mac Reds. Coxes, to me, are the breath of autumn. But the toes of our Christmas stockings were always filled by tangerines wrapped in foil. The taste of Christmas morning. Tissue paper was what our tangerines were wrapped in. Mum hung on to them for our noses or the outside lav. I found a photo I took of my Christmas apple! Greyduster you said you hoped to ' cabbage' some apples next year, I have never headed that expression before. What does it mean? The term ‘to cabbage’ can be interpreted, with regard to fruit, as scrumping, although the tree I have my eye on is not inside anyone’s boundary so I will not be led away in handcuffs! I hope! Fennel that’s interesting. 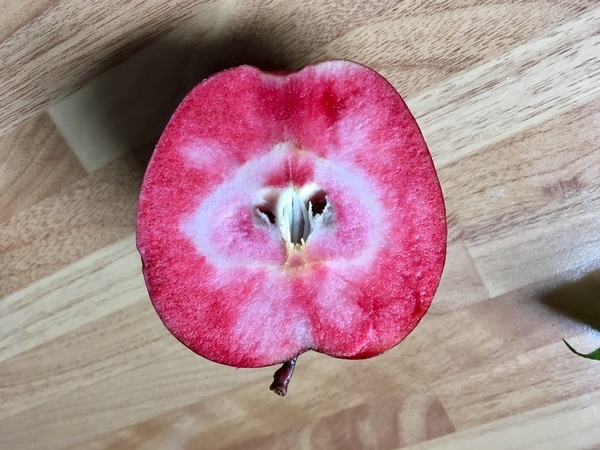 I read an article online from a few years ago that said they were planning to introduce a red fleshed apple into supermarkets, but I don’t think it got off the ground. Thanks*Greyduster*. I wonder where it originated? I have never heard of this variety of apple before. This post has just made me realise I have not bought any russets this Christmas. I have bought them every Christmas since I married in 1976. They remind me of my Dad, he loved russets. I must get some tomorrow. I wish I'd kept some seeds from them now. If you had saved the seeds, Fennel, do you think they might have come true to type? How do they pollinate? I'm not an expert, GD. But I find this very interesting, and when I next go to this market will ask them where they found their Mac Reds. I didn't know they were so rare.